After ethnic cleansing of the Azeri population of Armenia, inseparable part of Azerbaijan -- Nagorno-Karabakh -- and seven adjacent districts of Azerbaijan, which was carried out by Armenian nationalists and their foreign sponsors in 1987-1994, more than 1 million Azeris have become refugees and internally displaced persons. Deportations and expulsion of Azeris in 1987-1994 are one of the episodes in the almost 200-years-long chain of ethnic cleansing and eviction of the ethnic Azeri population from Armenia and Karabakh. The beginning of the 19th century, when the Tsarist Russia started bring the Azerbaijani khanates under its control, should be considered the first phase of these artificial demographic changes. Effectively, the history of the Armenian-Azerbaijani conflict takes its origin from the large-scale resettlement policy of the 19th-20th centuries in the South Caucasus, which was launched by Tsarist Russia and continued by the USSR till the dissolution of the Soviet state. One of the main causes of the large-scale resettlement policy was that Tsarist Russia, after conquering new territories, initially did not trust the indigenous Caucasian people and deemed it necessary to populate the region with "trustworthy" peoples to consolidate its authority there. For this purpose, Armenians were chosen as early as in the early 18th century during the reign of Emperor Peter I, but implementation of the resettlement policy began in the period of lengthy Russian-Turkish and Russian-Persian wars of the second half of the 18th century and early 19th century. As the Russian troops advanced in the South Caucasus, Commander-in-Chief in the Caucasus General P.D. Tsitsianov took charge of the resettlement process, launching it in October 1803 and pointing out the ethnic Armenians' desire to "see the most rapid and successful establishment in these realms of the Russian authority." From that time on, Armenian settlers started to populate the Irevan and Karabakh khanates of Azerbaijan. However, the large-scale resettlement policy started after 1828, when the Russian Empire and the Persian state signed the Turkmanchay Peace Treaty. Under the treaty, Azerbaijan was divided into two parts, northern (incorporated into Russia) and southern (remained Persian), and the Araz river was the demarcation line. Special entry was Article 15 of the Turkmanchay Treaty, which allowed "all the residents and officials of the Azerbaijani district (of Persia) one year of time for free resettlement with their families from the Persian districts to the Russian ones." First and foremost, it targeted the "Persian Armenians." At the same time, the "sublime ukase" by the Russian Senate was passed on 21 March 1828, which read that "Pursuant to the treaty with Persia, which was signed 10 February 1828, we decree that the Erivan khanate and Naxcivan khanate, both incorporated into Russia, be henceforth called the Armenian district." This laid the foundation for the future Armenian statehood in the Caucasus. Overall, only under the Turkmanchay Treaty, 40,000 Armenian families moved from Persia to Azerbaijan in several months' time. Then, implementing the treaty with the Ottoman Empire, Russia moved from Asia Minor to the Caucasus another 12,655 Armenian families (about 40,000 people) in 1830. In total, in 1828-1830, the empire resettled 84,600 families from Turkey to the Caucasus and gave them the best lands in Karabakh, Irevan (Yerevan), Borcali, Akhalkan and Akhaltaxisin. Armenians settled not only on the Karabakh lands, but also on the territories in the mountains around the Goyca lake (which was renamed by Armenians into Sevan), where initially 12,400 families were moved initially and more followed, according to official data, later. In the period from 1828-1839, 200,000 Armenians were moved to the mountain areas of Karabakh. In 1877-1879, during the Russian-Turkish war, additional 185,000 Armenians were resettled in the south of the Caucasus. As a result, considerable demographic changes took place in the north of Azerbaijan, which were further deepened by the departure of the local population from the areas populated by Armenians. These opposite migration flows were quite "legal" because the Russian authorities did not prevent departure of ethnic Turkic Azeri people to the Iranian and Ottoman lands as they moved Armenians to the Northern Azerbaijan. For example, in 1827-1828, of the total of 4,600 families in the Naxcivan khanate, 4,170, or more than 90% were Azeris. But after the resettlement campaign, 1,400 Azeri families left the area, and in 1832, roughly 2,791 families, or 60% of the total number of residents, were Azeri. The greatest migration took place in 1893-1894. Already in 1896, the number of ethnic Armenian arrivals reached 900,000. Because of the immigration policy, the number of Armenians in the Transcaucasus in 1908 reached 1.3 million, of which 1 million were invited by the Tsarist authorities from foreign countries. Later, after the fall of the Russian Empire and emergence of independent states, the Dashnak Armenia declared war on Georgia and Azerbaijan. The Dashnak carried out bloody massacres of the Azeri population of Armenia, Zangezur, Karabakh and other areas. Mass extermination of the ethnic Azeri population was carried out in 1918 in Baku, Quba and other cities of Azerbaijan. A real war began against the civilian population as Armenian detachments bombed the Azerbaijani quarters of Baku and other populated areas from the sea and air, using artillery, airplanes and battleships. As a result, according to verified data, in the spring-summer of 1918, more than 50,000 Azerbaijan Turkics, Talysh, Lezgis, Avars, Jews and other ethnic groups died at the hands of the Dashnak detachments. In total, according to rough estimates, more than 500,000 Azerbaijanis suffered different degrees of damage from Armenian nationalists in that period. Eventually, these events resulted in the creation of the Armenian state in the Transcaucasus in 1921. Professor V.A. Parsamyan wrote in his "History of the Armenian people -- Hayastan 1801-1900": "Before incorporation into Russia, the population of Eastern Armenia (Irevan khanate) was 169,155, of which 57,305 (33.8%) were Armenian, 84,089 (49.7%) were Muslim, 26,911 (16%) were Kurds and 850 (0.5%) belonged to other ethnic groups." After the occupation of the Kars district of the Armenian Dashnak Republic (1918), the population increased to 1,510,000. Of these, 795,000 were Armenian, 575,000 were Azeris, and 140,000 were representatives of other ethnic groups." The creeping expansion over the Azerbaijani territories and deportation of the Azeri population of Armenia continued in the Soviet period too. In 1948-1953, more Azeris were forced to leave their historical territories in the Armenian SSR. On 23 December 1947, Chairman of the USSR Council of Ministers Joseph Stalin signed Decree No 4083 ("On resettlement of kolkhoz farmers and other ethnic Azeri population from the Armenian SSR to the Kura-Arax lowlands of the Azerbaijani SSR"). According to the decree, some 100,000 Azeris were evicted in an organized manner from the Armenian SSR and moved to the arid desert areas of the Azerbaijani SSR. The formal cause was resettlement to Armenia of a new group of Armenians from abroad. Ethnic Armenians from Lebanon, Iran, and Syria settled on the lands which had been occupied by Azeris who were forced to leave in 1948-1952. In the late 1980s, the Armenian nationalists launched the final phase of deportation of Azeris from Armenia and Nagorno-Karabakh, and later from the seven adjacent districts of Azerbaijan. Precisely with the beginning of the Perestroika-related innovations in the USSR, Armenia's claims on Nagorno-Karabakh gained a new impetus and characters. In 1986-1987, first Azeris refugees started to flee Armenia. The Armenian organizations Krunk in the NKAO itself and the Karabakh Committee in Yerevan, which mushroomed after the "Perestroika rain", had again set out to implement the project of effective separation of Nagorno-Karabakh. The Dashnaktsutyun party emerged again: At its 23d Congress in Athens in 1985, it set as its top-priority objective "creation of a single and independent Armenia" and implementation of this slogan by incorporating Nagorno-Karabakh, Naxcivan (Azerbaijan) and Javakheti (Georgia) into Armenia. As always, the Armenian Church, the nationalist circles among the intelligentsia, and the foreign ethnic Armenian communities were involved in the implementation of this plan. The rallies in Yerevan in the fall of 1987 signaled mass deportations of Azeris. Although the main goal of the rallies was raising demands of the social, economic and environmental nature with the Soviet leadership, they eventually transformed into calls for "eviction of the Turks from Armenia." The open threats by Armenian nationalists against Azeris started to be voiced in 1986, when the Karabakh issue was raised, still unofficially then, by some circles in the ethnic Armenian community abroad. In the same year, and in the next year of 1987, refugees started to arrive in Azerbaijan, mainly from the Kapan and Megri districts of Armenia. In November 1987, two cargo cars arrived in the Baku rail station, full of ethnic Azeris who were forced to flee the predominantly ethnic Azeri-populated villages in the Megri and Kapan districts in the south of Armenia. On 25 January 1988, four buses full of Azeri refugees from the Kapan District of Armenia arrived. But all this was just a "tip of an iceberg," as it became immediately evident that the other goal secession of Nagorno-Karabakh from Azerbaijan. During the same period, signatures were collected en masse in Karabakh and Armenia under the demand to transfer Nagorno-Karabakh to the Armenian SSSR -- a process which its organizers dubbed a "referendum." On 1 December, a delegation of the Karabakh Armenians filed the signatures, letters and demands to the incoming correspondence office of the Central Committee of the USSR Communist Party in Moscow. Then other delegations of Karabakh Armenians started to periodically visit Moscow. Influential Armenian scientists and public figures (writer Zoriy Balayan, historian Sergey Mikoyan, poet Silva Kaputikyan and others) actively lobbied the Karabakh issue abroad. In November 1987, Mikhail Gorbachev's advisor Abel Aganbegyan, chairman of the USSR Council of Ministers' Economic Bureau, came out in support of the idea of re-subordination of Karabakh. Both in Azerbaijan and in Armenia this was viewed as a proof of Gorbachev's support for the Armenian campaign. Never forget the bloody days of 1915, never forget the horrors which were inflicted by Talat Pasha, Enver Pasha, Camal Pasha! Live and remember! Everyone who calls himself Armenian! Sweep the Turk from your land! Do not give him water from Armenian springs! Do not give him bread baked by an Armenian woman! Turks, out of our city!" In February 1988, 2,000 Azeris left Armenia and moved to Azerbaijan, mostly to Baku, Sumqayit and Ganca (then Kirovabad). By late February 1988, more than 4,000 people moved from the Armenian SSR to Azerbaijani SSR, many of whom were beaten up, wounded, suffered from frostbites, and most of whom were unable to take with them even a small portion of their property. These refugees acted as a catalyst of anger and rallies in Azerbaijan. The most difficult situation took place in Sumqayit, a town where refugees from Armenia arrived in large numbers and which was flooded by 4,500 repeat offenders from all over the Soviet Union who were released on pardon recently and sent to the town by someone's orders. On 20 February 1988, the policy guideline of the Armenian terrorist organization Karabakh was made public at the Yerevan Writers' Palace, which was depicted by the press, in conformity with the political situation of the period, as all but a model of struggle for "democracy and human rights." In 1988, Karabakh activists created in Xankandi (Stepanakert) their subsidiary, Krunk, which was to put into practice the heinous scenario which was written and tested by the Armenian ideologues as early as at the turn of the 20th century. 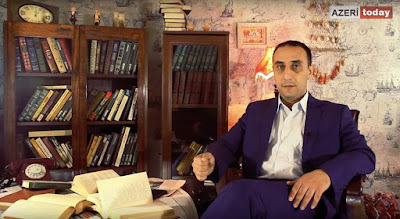 It was precisely the possibility of repetition of that monstrous scenario that Azerbaijani writer Omar Faiq Nemanzada pointed out back in 1906 on the pages of the Irsad newspaper: "Be that as it might, the Armenians will carry out their plan to create Armenia by fair means or foul, and they will certainly attempt to oust us from Irevan, Karabakh and Kars to achieve that goal. We must know and remember that Armenians will stop at no meanness. They will make the Muslims rise against them, provoke an attack on themselves, in which they will deliberately suffer great losses, and then start weeping so loudly as to be heard all over Europe about their long sufferings. They will gradually start preparing a plan to commit their crimes and seek ways of their perpetration." Similar instructions were received from the Armenian terrorist organization Dashnaktsutyun by one of its branches in the Caucasus, Krunk. "We are ready to die. If we cannot secede, we shall stop at nothing,"-- bearded men from Krunk shouted in the face of the Soviet newspaper Izvestiya correspondent A. Kazikhanov. Some time later, precisely the activists of the Armenian terrorist organization Krunk provoked Armenian pogroms in the town of Sumqayit. The situation became critical when on 23 February 1988 the leadership of the Nagorno-Karabakh Autonomous Area announced secession from the Azerbaijani SSR at a session of the Area Soviet. The decision was made to send a request to the Supreme Councils of Azerbaijan, Armenia and USSR to gratify Nagorno-Karabakh Autonomous Area's desire to withdraw from Azerbaijan and accede to Armenia. On 24 February 1988, the first blood of Karabakh conflict was drawn in Askeran, Nagorno-Karabakh: Two Azeris were killed. On 26 February of the same years, a rally was staged in Yerevan with participation of hundreds of thousands of people who shouted "Miatsum!" in the Armenian language in support of the demand of Karabakh Armenians to join the Armenian SSR. Open calls were made at the same rally to forcibly expel the Azerbaijani population from Armenia. After the rally, well-organized and controlled pogroms of Azeris were launched in different parts of Armenia with support of the local authorities and law enforcement bodies. The USSR leadership in Moscow remained silent, which caused more anger in Azerbaijan and was seen as tacit approval of the ethnic cleansing in Armenia and separatist sentiments among the Armenians in Karabakh. The Sumqayit events which followed in February 1988 were skillfully exploited by the Armenian nationalists to launch a campaign of total violent deportation of Azeris from Armenia and provocation of the Karabakh conflict. The organizer of the mass expulsion of Azeris was First Secretary of the Armenian Communist Party Central Committee Suren Arutyunyan. He was the very Dashnak wearing the Communist skin who as early as in 1965 organized student demonstrations in Yerevan on the 50th anniversary of the "Armenian genocide." About 200,000 Azeris, were drivenout of Armenia by force, at gunpoint. 255 Azeris were killed: Two were beheaded, 11 were burned alive, three were cut into pieces, 23 were driven over by car, 41 were beaten to death, 19 froze to death in the mountains, 8 went missing and so forth. Also, 57 women and 23 children were cruelly killed -- their bodies were found immured in chimneys. Unable to bear pogroms, killings and violence by Armenian nationalists, tens of thousands of residents of the Azeri villages in Armenia, in particular, in the Ararat District, fled in the summer 1988 toward the Soviet-Turkish border and lived for four months without a shelter on the bank of the border river of Araz. Never mind the fact that the Armenian leaders did not move a finger to help these people, it emerged later on that the attacks on the Azeri villages were headed not only by heads of district administrations, but also by some central government officials, in particular, former deputy chairman of the Council of Ministers Arutyunyan, chairman of the Masis District Executive Committee Gevorkyan and head of the District Internal Affairs Department Iskandaryan. On 14 June 1988, 4,000 Azeri refugees from Armenia arrived in Azerbaijan. According to eyewitness reports, Armenian gangs are well armed and equipped with armored vehicles and helicopters. In the mean time, expulsion of the Azeri population from Stepanakert (Xankandi) started in Nagorno-Karabakh. In August 1988, residential areas where ethnic Azeris lived were burned in Xankandi, Azerbaijan. Armenian police and Nagorno-Karabakh authorities overtly support the terrorists. The Azeri families are issued an ultimatum and given a deadline to leave their native city. One of the ideologues of the terrorist organization Karabakh, V. Vardanyan, explained the hatred for Azeris among the Armenians in the following manner: "It has not been proven historically that Armenians and Azeris can be brotherly... The Armenian must be born with weapons in his hand... The Armenian people will live forever if the nation becomes the army and if the religion of the nation is not some contrived god, but the nation itself." As a result, the official ideology of modern-day Armenia is nationalism. On 6-7 September 1988, the Azeri towns of Xocali and Karkicahan in Nagorno-Karabakh were attacked by large Armenian gangs. Some of the residents -- ethnic Azeris -- were killed or wounded. Well-organized Armenian gangs numbering up to 6,000 gunmen who were armed with modern weapons were taking part in attacks on Azeri villages and towns according to reports. ("Crimes by Armenian terrorist and gang formations against humanity (19th-21st centuries). The brief chronologic encyclopedia" -- Institute for Human Rights NANA, Baku, Elm Publishing -- 2002). In November 1988, according to Academician B. Budagov's data, the Central Committee of the Armenian SSR Communist Party approved the plan for violent expulsion of the ethnic Azeris from the territory of the republic. The deadline for completion of the plan was set on 5 December 1988, after which celebrations were organized all over Armenia under the slogans of "Armenia without the Turks!" On 27 November 1988, in the village of Zahmat near Masis, Armenia, Armenian gangs brutally killed a 10-years-old girl, a 60-years-old woman and three young Azeri men. Executions were carried out to terrorize the civilians. In the same administrative center of Masis, a mosque was burned. In Yerevan, a mosque, the M.F. Axundov Azeri-language secondary school and Azeri Drama Theater were burned. The Armenian vandals totally destroyed the Azeri cemetery. On the same day eyewitnesses reported that in Gugark, Armenia, in the village of Shaumyan the Armenian bandits perpetrated bloody crimes in which more than 10 Azeris were brutally killed or tortured to death. On 25-28 November 1988, Gugark District Executive Committee Chairman Gamlet Sarkisyan and Shaumyan State Farm Chairman Zhora Arakelyan organized killings of ethnic Azeris. Criminal proceedings were initiated by the USSR Prosecutor's Office and Armenian SSR Prosecutor's Office against the perpetrators. In November 1988, in the town of Spitak Secretary of the Spitak Town Committee of Communist Party N. Muradyan, First Secretary of the District Executive Committee of the Communist Party F. Abuchyan, Chief Medical Officer of the District R. Bagdaryan, Judge E. Nazaryan, Police Chief V. Sarkisyan, and Prosecutor Arakisyan, accompanied by several armed bearded men, evicted Azeri families from their apartments and lynched them. As a result, 36 people died, unable to endure severe torture. Seventy children, aged from 5 to 12, were immured alive in presence of their parents in a 20-meter-long pipe with the diameter of 1.5 meters, which was prepared in advance. Twenty-seven more Azeri children were taken in an unknown direction. "On 27-28 November 1988, First Secretary of the Spitak District Committee of the Communist Party Norayr Muradyan organized a presumable evacuation of Azeris from Armenia. People were loaded into trucks, but they had never reached the destination. Between the predominantly ethnic Russian-populated villages of Lermontovo and Fioletovo, these innocent people were burned alive. There were children, women and the elderly in the trucks. Few people who survived by miracle walked for five days across the snowy mountain passes of the Caucasus Ridge to reach the Qazax District of Azerbaijan. Those people who had lost their way went back to the village which lived under blockade. There was no bread supply for six months, and the electricity supply was absent for the same period. "On 1 December 1988, when I found out that Armenians were preparing to attack an Azeri village, I made an attempt to reach Ghursali via the village of Saral and warn the residents that 1,500 extremist students from Yerevan, Stepanakert and Kirovakan were going to attack these villages," Sanuber Saralli reported ("Genocide. Annotations for Districts. The list of the dead and brutally killed in Western Azerbaijan in 1987-1992"). In the village of Shaumyan in Gugark District of Armenian SSR, for example, eviction of Azeris took place with participation of the village council chairman and other officials,"- the Pravda newspaper reported on 7 January 1989. Maharram Abdul Oglu Aliyev, a 60-years-old survivor, described the horrifying acts of violence during the expulsion of Azeris from the Vedi area (Ararat District) of Armenia in 1988. Here is the testimony of M. Aliyev: "Five armed Dashnaks forced me into the UAZ vehicle, blindfolded me and took me in an unknown direction. Roughly 30 minutes later, they removed the blindfold and told me to get out of the car. When I got out, I saw three women and four men, all hanged on the boughs of trees. I did not know where I was, I knew just that I could see Azeris hanging in the gallows. I was ordered to walk towards the stream, and then I realized that it was the Zangi river, and saw three dead bodies on the bank. They told me to remove covers from the faces of these bodies. It was a young pregnant Azeri woman, who was killed with an unborn baby, and next to her lay two of her very young daughters. When I saw this kind of cruelty, I fainted. When I regained my senses, I saw that they tied large boulders to the seven hanged people and the killed woman with her children and threw them all into the Zangi river. One of the Dashnak came to me and said: "Look, Turk, while there are Armenians on this earth, we will always do the same to the Turks everywhere. We are not killing you so that you can see this, never forget this till your last day and tell all the Turks about us..." (Sanuber Saralli, "Genocide. Annotations for Districts. The list of the dead and brutally killed in Western Azerbaijan in 1987-1992"). In November-December 1988, the completion of the process of expulsion of the ethnic Azeri population was widely celebrated in Soviet Armenia on the initiative of the Dashnaks and "bearded men" -- all types of terrorists, gunmen and criminals -- who arrived in the country in large numbers. However, the "celebrations" of the total elimination of Azeris from Armenia coincided with a catastrophic earthquake in Armenia, which the believing Armenians call God's punishment "for ousting the Turks" to this day. Since then, a religious, or, as some people say, mystical importance has been attached in Armenia to the date of the earthquake. Even the 7 December 1988 earthquake was used by the Armenian authorities for their dirty purposes, however: Entire Azeri villages were destroyed, and this was then attributed to the earthquake. "I still remember the words of one old Armenian who fearlessly hid me after the earthquake: 'God punished us for ousting the Turks,' she used to say"-- S. Saralli, who survived both Armenian pogroms and the earthquake, reminisced. (Sanuber Saralli, "Genocide. Annotations for Districts. The list of the dead and brutally killed in Western Azerbaijan in 1987-1992"). On 11 December, the military-transport Il-76 aircraft of the Azerbaijani aviation was downed near Gyumri (Leninakan), carrying 50 Azeris, 13 Lezgis, 11 Russians, two Tatars, one Armenian and one Jew who were flying to provide assistance to Armenians after the earthquake. Everyone was killed but one person. Only Fahraddin Balayev survived, who was in a truck which was inside the aircraft. A huge crowd of Armenian nationalists assembled around the smoking debris of the aircraft, and only at the cost of losses among the Soviet Army personnel who cordoned off the crash site that Fahraddin -- the only surviving passenger with a broken spine -- could be saved. Next day, on the night of 11 December, the Yugoslavian military-transport aircraft An-12 crashed when approaching Yerevan-- it carried aid to the victims of the earthquake in Armenia. All seven crew members died. The aircraft flew the international air route, Yugoslavia-Bulgaria-Turkey-USSR. Because the Yugoslavian An-12 was on transit via Turkey, Armenian nationalists downed it near Yerevan, mistaking it for a Turkish aircraft. The meteorological conditions in the airport were normal. The traffic control's communications with the aircraft were in English. But it was suddenly interrupted when the aircraft started the landing procedure over the Yerevan airport. The aircraft crashed 12-13 kilometers from the Zvartnots aircraft. Taking advantage of the huge stream of humanitarian aid to Armenia, the republic's nationalist leadership organized a major arms smuggling scheme to Armenia with help of ethnic Armenian communities abroad. Armenian terrorists and cutthroats from the Near East and other regions also started to flock into the country. "The entire Russia was helping the residents of Armenia," -- USSR KGB officers Vladimir Lutsenko and Valeriy Khmelev recollect. "But few people know that gunmen shot our airborne men in the back as they stood in cordon around the ruins caused by earthquake -- by that time, the extremists started to arm." V. Lutsenko and V. Khmelev noted: "Considerable amounts of weapons of different types were sent from different countries to Armenia, disguised as humanitarian aid." The materials of the Azerbaijani Republic State Commission for affairs of the prisoners of war, hostages and missing citizens show that after the catastrophic earthquake in the town of Spitak, small groups were organized from among the activists of the Armenian terrorist organization Karabakh. They stole cars and medicines which were supplied from all over the world via the Zvartnots airport in Yerevan, robbed shops in the cities and towns that were damaged by the earthquake, removed wrist watches, jewelry and money from the dead bodies and so on. The Russian sources also confirm this. According to the verified data, during the process of deportation of Azeris from Armenia in 1987-1989, 214 Azeris were killed, of which 127 (59%) were brutally killed. The majority of these (50% or 23%) were beaten to death, and another 35 people (16%), of which four were children and 10 were elderly, died after cruel torture. Fifteen Azeris (7%), including 9-years-old Z.I. Nabiyeva and 78-years-old G.M. Aliyeva from the Gugark District, were burned. The same number, 15 people, were shot (two of them were children and six were elderly). Seven people were driven over with cars, three were drowned, one was electrocuted, and finally, 19-years-old B.I. Hagverdiyev of the Amasia District was hanged. Another 65 people died from different causes: From heart attacks after what they had seen and survived (10 people), because of the medical personnel's negligence in hospitals (6 people), or from freezing in snow storms when they were fleeing from Armenia (49 people). Finally, two people could not endure humiliation and committed suicide, 12 people, according to Azeri witnesses, died in "accidents" which were organized by Armenians, and the destinies of eight people remain unknown and they are considered missing. Simultaneously with the tragedy of Azeris who were evicted from Armenia, the process of pushing the ethnic Azeri population out of Nagorno-Karabakh also continued as many-thousands-strong groupings of Armenian gangsters who were armed to the teeth and trained by foreign military instructors were formed. Igor Muradyan, one of the activists of the Karabakh movement, said that in the summer 1986 Karabakh Armenians with help from the Dashnaks received the first shipments of the light weapons from abroad. Eventually, shipments of weapons became regular, and "for some reason, there were a lot of Czech-made weapons." The weapons were mainly sent to Nagorno-Karabakh. "All the organizations in Karabakh were armed. All the local Communist Youth League members had personal weapons" -- Muradyan noted proudly (Thomas de Waal, BBC, http://news.bbc.co.uk/hi/russian/in_depth/newsid_4640000/4640183.stm). In his interview with British journalist Thomas de Waal Igor Muradyan discussed how he planned and organized the Karabakh movement and demonstrated how thoroughly the campaign was designed, which enlisted tacit support from the high-level party functionaries and successfully mobilized huge masses of people. Answering the British journalist's question why activists of the Karabakh movement did not ask the opinion of 40,000 ethnic Azeris of Nagorno-Karabakh, I. Muradyan replied: "Do you want to know the truth?" -- he asked. "I will tell you the truth. We were not interested in the destiny of those people... Their destinies did not interest us back then, and it does not interest us now." (Tom de Waal, BBC). On 23 March 1988, the USSR Supreme Council Presidium passed the decree "On measures pertaining to the address of the republics of the Union on the developments in Karabakh and Azerbaijani and Armenian SSRs," which read, in particular: "It shall be considered unacceptable when attempts are made to address the complex ethnic and territorial issues by putting pressure on the state governance bodies in the situation of inflaming the emotions and passions and creation of all types of self-styled entities which support changing the national and administrative borders which are set down in the USSR constitution, as this might result in unpredictable consequences..."
On 1 December 1989, the Supreme Council of the Armenian SSR and the Nagorno-Karabakh Autonomous Area National Council passed the resolution "On incorporation of Nagorno-Karabakh into Armenia" at their joint session, which was a gross violation of the constitutions of the USSR and Azerbaijani SSR. At the same time, a new wave of ethnic Azeris who were expelled from Armenia arrived, and the refugees settled in Baku and other cities of Azerbaijan. The anti-constitutional decision on incorporation of Nagorno-Karabakh into Armenia and passivity of the USSR leadership on this issue resulted in mass disturbances in Azerbaijan, which ended up with expulsion of the ethnic Armenian population from the republic. On 20 January large formations of the Soviet Army were deployed in Baku, which mercilessly shot at and crushed with tanks the civilian population of the capital of Azerbaijan. The bloody action, which was called Black January, resulted in numerous casualties among Baku residents who tried to prevent the troops from entering the city. 133-137 people were killed and 800 wounded after the deployment of the troops in Baku. Taking advantage of the critical situation that had taken shape in Azerbaijan, the Armenian armed detachments occupied the village of Karki in the Naxcivan Autonomous Republic on the night from 19 to 20 January. The Armenian gangs also attacked the town of Sadarak in Naxcivan. There were casualties among the civilians. The heavy artillery and Grad multiple launch rocket systems regularly fired on other Azerbaijani villages in Naxcivan. The Armenian bandits and mercenaries carried out in that period hundreds of terrorist acts, killing great many Azerbaijani civilians. International terrorist Monte Melkonyan (apprentice of notorious Carlos the Jackal) took an active part in extermination of Azeri civilians: His detachments were directly involved in genocide of Azeris in the village of Qaradagli, city of Xocali and other towns and villages of Karabakh. 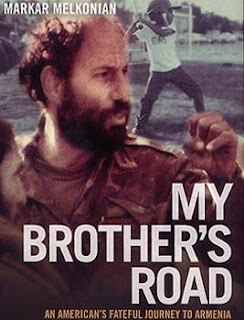 Atrocities which were perpetrated by Monte Melkonyan are described in detail by his brother, Markar Melkonyan, in the book which he published in the USA, My Brother's Road (Markar Melkonian, My Brother’s Road: An American’s Fateful Journey to Armenia, I. B. Tauris, London, 2005). In particular, M. Melkonyan's book lists facts of burning women, children and elderly by Armenian cutthroats. Markar Melkonyan's book describes how tens and hundreds of Azeris were brutally killed and how Armenian gunmen used to take Azeri prisoners to Armenia where they were publicly decapitated. On 17 February 1992, the Armenian cutthroats, with support of the 366th Motorized Rifle Regiment of the Soviet Army, took part in the capture of the village of Qaradagli. After taking the village, Armenians burned it to the ground and unleashed a veritable massacre there, in which 77 people were killed, including 10 women and 8 children; 54 people were killed with particular brutality. 104 people were taken hostage. Of them, 54 were killed when in captivity. Monte Melkonyan's detachments, other Armenian gangs and the 366th Motorized Rifle Regiment took part in what was perhaps the bloodies crime against humanity in the late 20th century: Genocide of 5,000 residents of the town of Xocali. On the night of 25 February, the Armenian gangs with support of the 366th motorized rifle regiment wiped off the face of the earth the peaceful Azeri town of Xocali. The capture of the town was accompanied by unprecedented atrocities against the civilian residents. In the very first hours of offensive, 613 people were killed. Among them were 106 women and 83 children. 56 people were killed in a particularly brutal way. 6 families were exterminated entirely. 25 children lost both parents, 130 children lost one parent. 476 people were disabled, 76 of them were underage. 1,275 people were captured. Although the majority of were later returned, the fates of 150 people remain unknown. Some of the incumbent Armenian leaders took part in this crime against humanity in Xocali, in particular incumbent President Serzh Sargsyan, Defense Minister Seyran Oganyan and so on. Serzh Sargsyan, then a field commander, noted in his interview with British journalist Tom de Waal: "Before Xocali, Azeris thought that they could trifle with us, they thought that Armenians were unable to raise their hands against the civilians. We have managed to dispel this stereotype. This is what happened." (Thomas de Waal. Black Garden). On 7-8 May 1992, Armenian gangs mounted an offensive on the jewel of Karabakh, the Azeri city of Susa. After a massive artillery and missile fire, which killed many civilians, the city of Susa was seized and turned into ruins. More than 23,000 Azeris were forced out the city of Susa, which in 1977 was declared by UNESCO a historical and architectural reserve and is called the "Karabakh musical conservation area." On 18-19 1992, Armenian gangs seized with support of heavy artillery the Lacin District, which is situated outside Nagorno-Karabakh. Many local civilians were killed or wounded. After the occupation, 63,341 Azeris were exiled from their native land. The occupation of the Lacin District showed that Armenian aggressors started to seize Azerbaijani territories outside Nagorno-Karabakh. On 27 March-3 April 1993, Armenian gangs seized the Kalbacar District of Azerbaijan, which is also not part of Nagorno-Karabakh, and 60,698 Azeris were driven out from their homes as a result. In June-August 1993, Armenian gangs seized several districts of Azerbaijan, from which hundreds of thousands of Azeris were ousted. Most of the Agdam District of Azerbaijan was occupied, and it too is outside Karabakh. The occupation caused numerous casualties among civilians, and 150,000 Azeris were driven out of their places of residence by force. The Azerbaijani town of Agdara was captured, with many victims among the civilians. Then the ancient Azerbaijani town Agdam was seized. Most of the Fuzuli District was occupied, which is not part of Azerbaijan's Nagorno-Karabakh. As a result, 152,860 Azeris were driven out of the areas of their permanent residence by force. The Cabrayil District was seized, which is not part of Azerbaijan's Nagorno-Karabakh. As a result, 57,125 Azeris were driven out of the areas of their permanent residence by force. There were casualties among the civilians. The elderly who decided to stay against the odds were brutally killed. Then the Qubadli District was occupied, which is situated outside Azerbaijan's Nagorno-Karabakh region. Regular artillery shelling and permanent attacks with employment of the latest military hardware, 31,364 Azeris, Kurds and Russians were driven out of the areas of their permanent residence by force. Among the victims of Armenian terrorism, there were women, elderly, children. After a long siege, the Zangilan District, which is situated outside Azerbaijan's Nagorno-Karabakh region, was seized. About 35,000 civilians were driven out of the areas of permanent residence by force. In a short period, a huge number of refugees from the Qubadli and Cabrayil districts -- about 300,000 of them -- flooded the republic. The same destiny befell more than 700,000 refugees from refuges from Armenia, Kalbacar, Lacin, Agdam, Fuzuli, and Zangilan districts of Azerbaijan, city of Susa and other towns and villages of Nagorno-Karabakh. About 1 million Azeris became refugees in their motherland after the Armenian occupation. The Armenian armed formations occupy the Nagorno-Karabakh Autonomous Area and seven adjacent districts of Azerbaijan, or almost 20% of the country's total territory. The preliminary estimate of damage that was caused to the Azerbaijani Republic was US$ 60 billion. Effectively, one in seven residents of Azerbaijan is a refugee or an internally displaced person, which was a heavy burden for the republic which was going through a social and economic crisis and all the difficulties of the war. In addition, after the dissolution of the USSR several tens of thousands of refugees of different nationalities who fell victim to different ethnic conflicts in former Soviet republics also arrived in Azerbaijan. In total, the number of internally displaced persons and refugees in Azerbaijan increased above 1 million. Armenians set about looting the occupied Azerbaijani territories. In the Karabakh war, 20,000 Azeris were killed, 100,000 were wounded, and 50,000 were disabled. The number of refugees increased and exceeded 1 million. According to official data, Armenians captured 4,852 Azeris as prisoners, including 323 women, 54 children and 410 elderly persons. The Armenian national-fascists were hiding from international humanitarian organizations the true number of prisoners and hostages, treated them inhumanely and mercilessly and humiliated them, turning them into slave laborers. The UN confirmed that an unjust war fought against Azerbaijan, the country's territorial integrity was violated and Azerbaijani territories are occupied by Armenians. The UN Security Council passed four resolutions (No 822,853, 874, 884) on withdrawal of the Armenian armed forces from the occupied Azerbaijani territories. A number of resolutions were adopted at the level of the UN General Assembly, European Parliament, NATO, Organization of Islamic Conference and other influential international organizations. But Armenian occupiers have been ignoring these resolutions to this day, demonstrating thereby their defiance of the international law and international community.